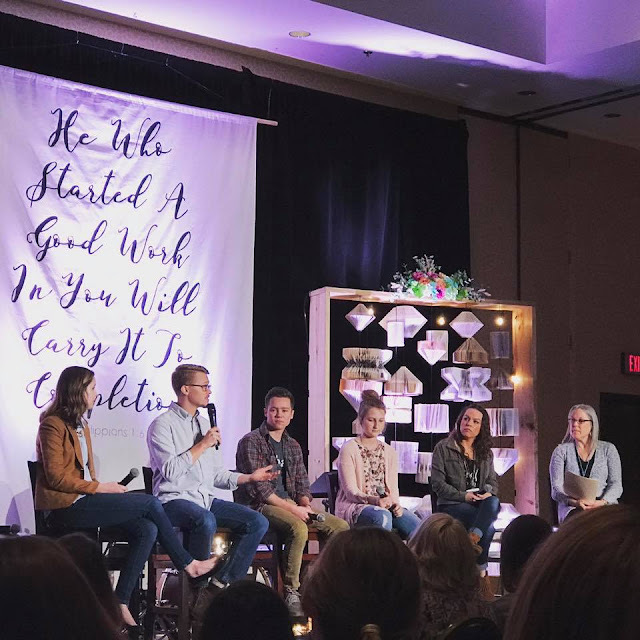 About a month ago, I sat in a hotel ballroom listening to a panel of adoptive and foster siblings, from 17 to 40 years old, talk about their experiences growing up in homes that weren't exactly traditional in their family structure. They didn't mince words about the trauma they'd experienced, about the fear they'd experienced, about the pain and grief that goes along with being part of a foster and adoptive family. Yet, to a person, they are all either already fostering and adopting or for those too young, they plan to. That was a breath of fresh air for a mama who was struggling through some previously unknown (at least to us) trauma that one of my children was processing through. I was honestly a little afraid to sit in that room. I didn't necessarily want to hear from kids who've grown up this way, because I still battle some insecurities and some American-ism on how families should be and how they should operate. Fenced yards, closed doors, isolated living, family vacations, and all that. That's not what our home looks like, for sure. Sometimes I still wonder if that makes me a bad parent. Last Sunday, I sat in my parents' living room, taping a video segment that we plan to use at church. They talked through their married lives, my childhood, and I sat and listened to their stories of countless strangers in and out of their lives and home, racial and ethnic diversity in a white-centric community, little regard for personal and property safety in the face of people who needed love, who needed a family. Am I worried about myself and my siblings? Not even a bit. We became Jesus followers, every last one of us. We became service oriented, every last one of us. They weren't bad parents, although I'm sure they faced the same criticisms. Our home wasn't 'normal' by any stretch of the imagination, and it made us better people. I used to get really defensive when people would question the impact of our lifestyle on our children. Of course my children are safe, I would angrily retort in my head. You really think I would put my kids in danger willingly? The thing is, that was a boldfaced lie. One I was trying to spin around my life even while I knew it to be untrue. Not to deceive myself, but to make myself look better to others. More acceptable. More conscientious. More "Christian". On the surface, I intended the lie to make other people feel better, but in the meantime, I used it as a way to make myself appear better. I wanted to look normal. I wanted people to think I'm smart and good at what I do. I wanted to be liked and admired. Maybe it's the season that I just came out of. Maybe it's just that I'm getting older. Maybe I'm no longer so scared of what other people think. Maybe I no longer feel the need to conform to the culture around me, not even if that culture is the Christian culture. I used to long to be normal. I used to pray for the day that my life would be normal again, but as I learned from another woman a little further along than me this past month - I can't go back. Even if all my circumstances changed to be what my white American dream of a life used look like in my head, I couldn't go there because I am changed. My eyes are open, my heart is broken, and I could never enjoy nor be content with that picture of normal. I don't need to look better anymore. I don't have to defend how we live to others. I don't have to pretend to be someone I'm not for the sake of other people's comfort. Last week, my eldest son offered to give up the room that he's been long awaiting to share with his little brother so we could bring someone else into our home to stay. Our eldest daughter offered to sleep on a couch so we have space for another set of bunk beds. Our children voluntarily offer themselves up to the pain and grief that they are no strangers to, that they know is for sure at the end of the journey, over and over and over because they are changed. Our kids are at risk from people and circumstances that we bring into our home. Their risk has made them brave. Our kids have experienced pain and trauma, violence and destruction in their own home and family. Their scars have made them tender. Our kids have given up their rooms, their belongings, and their activities to others. Their willing sacrifices have made them generous. Our kids have loved, and still love, undocumented immigrants, criminals (both in and out of jail), the mentally ill, drug addicts, drug dealers, the homeless, the elderly, people who smell bad, people who look dirty, people who are mean and hateful...and not only that, but they've sat at a dinner table with many of them. Their love has made them beautiful. This past weekend found me in a familiar place with some familiar people and some all-too familiar chaos surrounding me. Every year for the past five years, I've gone to a conference for foster and adoptive mamas in Georgia. Every year for the past five years, some kind of 'big' emotional, potentially life-changing event surrounding our involvement with foster care or our adoptions has come up. This year, no different. I found myself in a rental car with a friend in the middle of Kentucky, fielding decisions about placements and our future. Fortunately for our sanity, one of those possibilities didn't pan out, so now we're just left with some processing to do in our family and some waiting to do until we get some answers. I talked with another friend once we arrived, and she mentioned the same sort of thing happens to her. Every year seems like an Ebenezer of sorts. In my case, I literally take home a rock every year to commemorate. Each rock reminding me of whatever milestone we happened to be dealing with that particular year, and the mound of those rocks on my nightstand reminding me daily of God's faithfulness. Usually I come home with a thousand ideas and thoughts, and my mind races with all the possibilities for our future. This particular year, even though there was still Big Things to learn and decide on and think about, I just found myself quiet and content. I spent hours on some rocks beside the lake. Thinking of basically nothing. Not processing, not begging for anything, not crying, just sitting and being present. One thing I am more sure of than ever is that God is with me. He is faithful. He is on my side. He is going to carry this story - HIS story - to completion. Not just until it ends, but until it is complete. I don't know what that looks like right now. I do know that the parts we're living through currently don't look like what I imagine redemption to be, but I believe that God is going to work it out anyway. I have to. 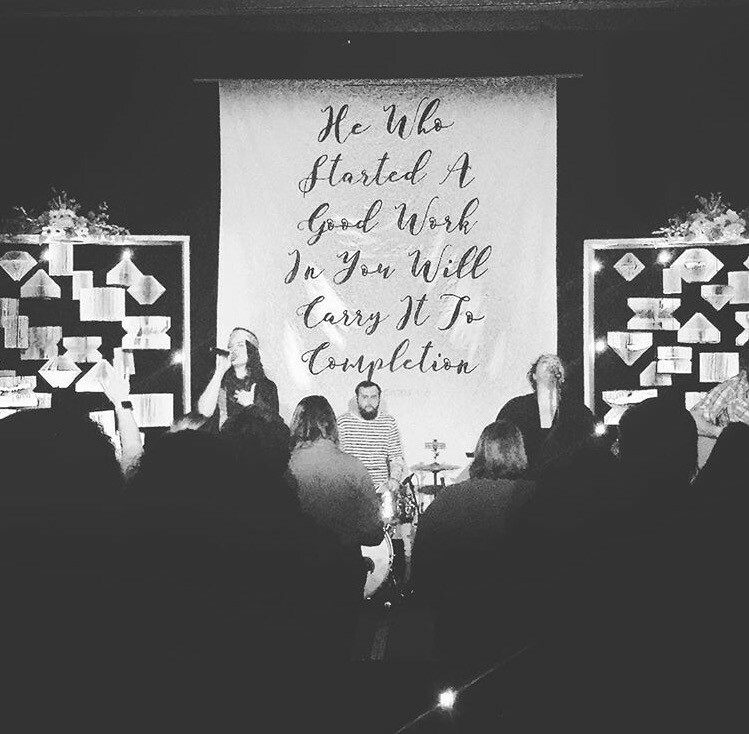 I started this post a couple days ago, and in the middle of writing, I spent some time listening to a sermon from Jen Hatmaker (yes, she preaches too - as if all the other stuff she does isn't enough) that just wrecked me. I'm bawling in the Sonic drive-thru waiting on my Diet Coke, thinking about a couple huge messes of situations that our family is in the middle of, thinking about how I'd rather not have ever known that life could be this painful, thinking about every hard thing that we're doing. Jen's message to me that day - every bit of brokenness is an invitation for conversion. Conversion - changing from one method of belief to another. THAT'S the truth of my life. All of this brokenness, every sharp edge of it - it cuts like a sword, but it's the point where I get to decide what this life is all about it. Do I stick with my old ways of thinking or doing or do I change to be more like Jesus? Do I give it to Him? Do I obey even when it seems crazy? Do I keep on even when I am rejected? Do I follow even when no one else gets it or likes it or supports it? In the middle of these broken pieces of life, I get to decide if His presence is worth it. I get to decide if I really trust in resurrection. I get to decide whether or not I'm going to continue to lay down my life and give myself away even if I don't see where this is all going or if it's going to end well. I get to decide if I truly believe. I get to do the thing right in front of me - obedient with even the very small steps - because I believe He is faithful. I believe redemption is coming. I believe He's working this to completion. I believe it's all worth it. I believe He is with me. I know, I know. Words are few around here of late. I've been trying to figure it all out, I suppose. My life seems segmented, like I'm just living in a series of snapshots, waiting for the whole thing to flow a little more freely than it has been. Saying goodbye to Little Man has been much more difficult than I ever imagined. He is not the child we have had the longest, he is not the child with whom I've bonded the deepest, and above all, he is not the child that we want in any way, shape, or form to be ours forever. We are thrilled beyond expectation that he is returning home to his family. His mom is a rock star, and I cannot say enough good things about her. His brothers and sister adore him, and he is loved deeply. I think that's why I've been caught off guard by the depths of the grief I'm feeling. I've spent entire weekends in a sobbing mess, unable to really even function normally. I drop him off and immediately want to spend the entire time he's gone in bed, shut off from the world. In the meantime, I feel neurotic about how sad I feel. Is it normal? Am I having a nervous breakdown? Why on earth am I sad when I want him to go home so badly? I think part of it is the intensity of the time I've spent with this particular child. He has been a challenge, maybe one of the biggest challenges of my life. I have been physically and emotionally exhausted for the nearly eight months he's been with us, and I think some of this heavy grief is just let-down from the overwhelming experience I'm getting ready to be done with. I think part of it is the intense joy he's brought to my life. He is the happiest of children most of the time, and his smile is absolutely contagious. His 'lub you, mama's make my heart lift with delight. When I picked him up tonight, he was so happy to see me, yet the minute we turned off of his road, he was asking to go back. Seeing his little smiley face in my rear view mirror, hearing him ask if we can sing 'down to the ribber', watching him clap his little hands, all of that fills me with immediate joy, followed by stinging tears. I find myself taking mental pictures of every memory, hoping not to lose it forever. We've sent kids home forever, and their time with us seems mostly lost now. Every once in awhile I'll get the stab of a fleeting memory, but it's always tinged with regret that I don't remember more. I don't remember how they smelled, what their voices sounded like, how their hair felt in my fingers. So when I hold him tight as he falls asleep, clinging long after he's drifted off, I'm trying to capture all those things in my mind, knowing that it won't be long before Little Man's memories are gone to me too. I don't know what it feels like to lose a child to death. I only know that this feels like hell. I have only days more as his mama, and I want to stretch out every minute even as I want to rip the band aid off and get it over with already. My relationship with him as it is will die. A permanent, irrevocable death. I might get to see him again; I certainly hope that's true, but when I do, I'll be the stranger again. Maybe I'll never see him again. There are no guarantees in this business. Maybe his mama will text me a picture, like the one we received of a former foster child this week, and I'll feel that loss all over, or maybe I'll grieve because we don't know what happens in his life and I will never hold him in my arms again. I want to be able to see what he grows up to be. I want to know that his curiosity and his mechanical skills take him far. I want to know that he won't forget us, even as I know that he definitely will. I want to tell him I'll love him forever, because that's true, but I know he will likely not believe it because of the pain that will come from our separation. I want now and the future, and it is grief because I have no right to that. That's not why we do this, and that's not what the outcome will be for us. Maybe at some point I'll give up my frustration with myself for not knowing if this is even ok to talk about or write about or frankly, even feel. Maybe at some point I'll be able to do this whole thing with more grace and more peace. Or maybe, this is grace and peace. Maybe feeling intensely is how I do this well. Loving with abandon, heart open, and still knowing that every time I do, it will get broken again. I'm figuring this part out still. This broken-hearted snapshot will someday merge into the rest of the pictures of my life, and I pray that, in the end, my life's art is beautiful. I pray it looks like love. I pray it looks like Jesus. Easter Sunday, I sat in a church packed full of my family (minus my brother who was literally pulling someone out of a burning building that day) to celebrate the Resurrection as well my youngest son's decision to be baptized. The most beautiful thing about that day actually wasn't even either of those things. It was that I sat in that church building not just with my immediate family, but with my children's family as well. Their first mama, their sister, their sister's parents...all of us there together at the request of our son who wanted to share that momentous day with his entire family. When we sang about letting the chains fall off and the gates of glory opening wide, it was enough to nearly make me leave the room in tears. The next few days though, I held children as they processed, yet again, through their past in tears. Redemption doesn't come without a cost. For my children, the cost has been high. There's so much pain and confusion to process through even as we see healing occur nearly daily. It was an emotional week, both highs and lows, and I was grateful to sit there with them. Honored to hold them up when they felt the pain would take them under. This week, I got to be the one held. It was one of the very worst weeks. I failed at being the parent I know I can be, the one that my children need. To be fair to me, they weren't all that successful at making great choices either. It was a rough week all around: emotional and traumatic, both for me and for them. I've cried more than I wanted to. I've yelled more than I wanted to. I've been angry. I've been graceless. I've been hurt and oh so lonely. I felt like I might break. I'm pretty sure my children think I'm already broken. Yet. There's been joy. There's been grace-filled moments. There's been love. There's been a serendipitous lunch meeting with fellow mamas going through the same kinds of things. And at the very moment when I was not sure if I could make it through this week intact, there was a friend. Friends are hard to come by, I'm sure you'll agree. A friend whom you can fearlessly text with all the vulnerability you can muster and say, I think this is it, this is the moment I break...well, that friend is a treasure indeed. All of the reasons that keep me from truly baring myself to others pale in the face of a friend who responds with immediate prayer, with a Scripture and a song to guide you through the darkness. It's not just platitudes. While it's encouraging to be told that God is with you, it's convicting to be told to fear not. To trust. To BELIEVE that God is with you. Particularly when you know that you haven't been living that way at all. A friend who'll encourage and convict in the same breath? That's a real friend. One that, even though she lives hundreds of miles away, is God's perfect grace in your life for that day. I am held up. In much the same way that I hold my children as they process their pain, telling them truth when they want to believe the lies, I am held up tonight by a truth-giving friend. I am blessed and grateful beyond measure. This coming Easter Sunday, my youngest son will be baptized, celebrating the part where death does not get the final word with the very picture of new life. It seemed appropriate to revisit this post from 2012. I wish that my tight-fistedness around my children's faith had eased more than it has, but I find myself still rehashing some of these same thoughts this time around. Today, I'm thankful for a God who is faithful to bear with all my control issues and for a son that is practically jumping out of his skin with excitement over Easter Sunday this year. Yesterday was my daughter’s birthday. Yesterday my daughter was baptized. Maggie has been asking to be baptized for over a year. True confession: I really didn’t want her to be baptized. We had put her off time and time again. Seven years old (still) seems too young to me. Does she even realize what she’s doing? What will it even mean to her at this age? Isn’t she well below the so-called age of accountability? Are we taking this too lightly by ‘allowing’ her to do this? Here’s the problem with that thinking: she understands. As best she can. God doesn’t require complete adult intellectual understanding to work in our lives. He definitely doesn’t require that of us in order to follow Him. She wants to follow Jesus with all of her little seven year old being. She wants other people to know that she wants to follow Jesus. Who am I to quench that spirit in her? My hang-ups are exactly that, my hang-ups. Jesus works in all of our lives individually, including my children. I want to manage their lives, their behavior, sometimes, unfortunately, even their relationship with Christ. But it’s their relationship with Christ, not mine. Fortunately for me (and others), I’m not the judge of other people’s relationships with Christ. Not even my own children’s. I remain faithful to teach them, to guide them, to pray for them, to love them with Christ’s love. That’s my part. All the rest of it – well, that’s God’s part. God’s been doing His part in my daughter’s life. Disclosure time? I’ve met this little girl. I totally get why other kids aren’t nice to her. God’s presence in her life has helped her see the intrinsic value of others. God’s presence in her life has given her compassion, a voice for the oppressed even in her own little community. She knows whose she is. She knows that she wants to follow Jesus all of her life. She knows the God we sing of in her favorite song, “You Never Let Go”, is real. She knows He’s never gonna let go of her. She’s learning to show that to others, and for her, that includes her desire to be baptized into and in front of the faith community that helped teach her these very truths. Even a child shall lead them. Yesterday, as she was dunked into a feed trough from Tractor Supply by her father and her grandfather at the front of our little sanctuary, I learned afresh that even a child, my child, can lead me into a deeper understanding of and love for the God who won’t ever let go of me either. We are in a slow countdown of final days with Little Man. Bureaucracy means sometimes it takes longer, and we can't ever count on anything, even a semi-official timeline. I'm struggling to know what direction to take the littles I spend my days with. How much effort do I put into training, into routines? How much do I love him? How tight do I hold him? How do I prepare him for the impending change? I simultaneously want to hold him tighter, never letting go, and just rip the band-aid off already. Feelings are complicated by the fact that Little Man is just hard right now. He's not badly behaved really, but he is a super challenging two years old. He requires constant supervision. Literal eyes-on constant supervision. The rest of our family is suffering through this stage. With Wendell working out of town frequently, I just don't have the amount of attention to give to the other children that they need because of the need to be with the littlest at all times. So I want him to go. I want him to stay. It's hard to take him to visits and see a functioning, happy family. It makes the delay of sending him home feel senseless. I get why we're going slow. I support a slow transition. I also hurt for his mama. She's done everything she needs to do and then some. She's motivated, and I think she's capable. And yet I'm worried for her. I'm worried for the kids. I think they might not be safe. I also think they will be safe. I think all of these things simultaneously. It's both and. All of the feelings about foster care and reunification and loving children like my own and my forever kids' feelings and much more wraps around me like a messy crochet of tangled up yarn. 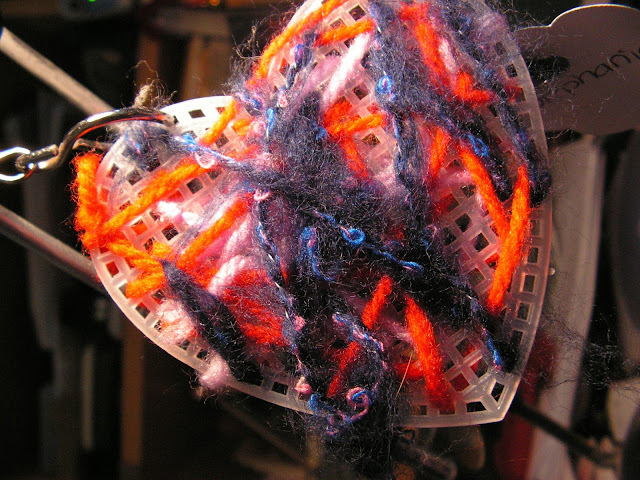 I can get bound up in the knots and tangles, or I can continue to sort through, finding the beautiful pattern in this tapestry we're weaving. I can remember that I have purpose here. Even today. Even in the final countdown. I can't just lose these days because I don't see the point in working hard anymore. God put me here, this day, in this family, with these children, for a reason. I am not Little Man's foster mom by accident. I have every day until he is moved from me to give my all. Every moment is love on display. Case changes come fast and furious in the child welfare system. Sometimes they're unwelcome. Sometimes they're long-awaited. I'm not quite sure where I should land on this latest case development with Little Man yet. I sat in a team meeting a couple weeks ago with Little Man's mom, the caseworker, Little Man's mom's attorney, and the foster care unit supervisor. Team meetings are where the case plan is gone over, amended, adjusted, and measured. It's a place where everyone can put all their cards out on the table and figure out what's best for the future for the families involved. Parent: Umm. Well, I tried to call about a job, but they didn't call back. Caseworker: Why haven't you been going to visits? Parent: Well, one day it was raining. I don't like the bus. Caseworker: What about this point of action? Parent: umm.... well....yesterday my cousin came over and he smokes dope and he stole my stuff. Point being, there are case plans that parents have to follow to get their kids back. My experience is that there are fifteen excuses per point, some valid, some invalid, some just flat out crazy. This does not reflect poorly on the parents' love for their children. We have yet to be involved in a case where the parents did not love their children intensely. It's just that sometimes people don't know what real love should look like. They do the best they can with what they're given, and honestly, there are so many odds stacked against poor parents whose kids are in the system that it seems like a miracle that anyone ever is reunified with their children. This past case meeting though? Not like that at all. Caseworker: What about this task? Caseworker: Did you do this part? Little Man's Mom: Done. Here's the documentation. Caseworker: So we're going to start transitioning your kids home. You're awesome. You did everything you're supposed to. You are ready. Seriously. Point after point, she demolished that case plan. She has literally walked from one end of the city to the other several times a day to get her stuff done so her kids can come home. She walks to visits in the cold. In the rain. She is seriously my hero. Things are stacked against her, and she works and works and does her best. Does this mean I have no concerns for Little Man's future? For sure, not. People have different standards of living, they have different values, and that's not an exception for our families. Does this mean I am completely fine and excited for Little Man to leave? Umm, that's a big fat no too. I am excited. I am excited for his mom. I am so happy that I got to meet her. I am excited that this family, scattered across four different locations, will be reunified in a safe and healthy home with services to support them as they work to make their future better. But. I feel the sadness rise up daily now. That anticipatory grief...the pain I know is coming. I want to clench tighter. I want it all to last longer. I want there to be years left of delight with this child instead of months left. I am so excited to be a part of this particular story. Even though it ends with my grief. It also ends happily for one family. Not pain-free, but definitely happily. This is worth it. Every single bit.